Given that Toulouse and Stade Francais, who meet in the Heineken Cup quarter-final on Sunday, have carried off more than a quarter of all the French championships ever played - Toulouse have 17 boucliers to Stade's 13 - you might expect that they would have a long history of high profile clashes. But they don't, for the simple reason that until the professional era their vintage periods have not collided. Even a time that has seen them carry off 12 of the last 16 national titles has hardly seem them together on the very biggest days. The Heineken final they contested in Edinburgh in 2005 is added to only one meeting in the national final, the Stade Francais victory in 1998 that ended a four-year spell of Toulouse dominance and sealed Stade's return to the front rank. By the time Toulouse became serious contenders in the early days of the championship, Stade were already on the slide from the standards that had seen them contest 14 finals, winning eight, in the tournament's first 17 seasons. The last of those 14 finals was in 1908. Toulouse reached their first final, which they lost to Stade Bordelais, a year later. They did clash in the final of the Coupe d'Esperance, introduced as a replacement for the championship during World War One, in 1916. Toulouse won 8-0. Other than that their only meeting before the professional era with a trophy at stake came in 1927. It was, as Toulouse's centenary history puts it 'an unexpected final - the clash of the two Stades' (while referring to the Paris club as Stade and their rivals as Toulouse prevents confusion, it should be remembered that the full, correct name used by many supporters is Stade Toulousain). Toulouse won a hat-trick of titles from 1922 to 1924, fell to Carcassonne in the semi-final the following year and reclaimed the title in 1926. They had quite a battle to get there in 1927. It took three matches to settle the quarter-final with Carcassonne, Toulouse getting home 6-0 in the second replay at Lyon after contests reckoned brutal even by the standards of the French club game in the late 1920s. The final was very different, recalled by Paul Voivenel in his Mon Beau Rugby as a model for such occasions, played in a manner which was 'strong, sporting and intelligent'. Voivenel was a romantic and reactionary who was later a leading advocate for the suppression of rugby league under the wartime Vichy regime. It could have been played in Bordeaux. But Voivenel reports that Stade, in the best quixotic traditions of the gentleman-amateur, insisted on challenging the reigning champions on their own turf. So it was played on a sultry afternoon on May 29 1927 at the Stade Ponts Jumeaux in Toulouse. A 20,000 crowd observed a minute's silence for Aime Cassayet, France's captain only a few months earlier and record cap-holder with 31, who had died of cancer and was buried that day in Tarbes. The match saw one of France's finest threequarter combinations - centre Francois Borde and wing Adolphe Jaureguy - in opposition as captains. They had also been schoolmates in Tarbes and played together both in Racing Club's losing final of 1920 and Toulouse's victories in 1922 and 1923, before the charismatic Jaureguy returned to Paris and joined Stade. The only man in his team who had played a final before, Jaureguy was the star - a big, classically quick winger who would equal Cassayet's record for caps, write an early rugby autobiography, Qui Veut Jouer Avec Moi?, and become a selector and vice-president of the French Federation. Bordes, playing in his fifth final for Toulouse and sixth in all, was in playing terms the straight man, the classic enabler at centre. Jaureguy was to write: "I doubt that any winger can have been better served by his centre". Bordes was not, though, entirely unobtrusive, always wearing a beret on the field and going to great pains to ensure that it was never knocked off. And this was to be Bordes' day, but not before a great struggle. Stade were level at half-time, hitting back with a try by scrum-half Georges Daudignon after wing Clement Dulaurens had opened the scoring for Toulouse. The men who kicked the conversions had distinctive lives - Toulouse centre Rene Salinie would live to within a few weeks of his 100th birthday before dying in 1996 while Stade prop Chaya Leib Herzovitz had a cosmopolitanism usually associated with more recent finals, as a Turkish-born Polish Jew. It was Herzovitz's dribble that set up the position from which outside-half Andre Verges dropped the second-half goal that gave the Parisians a 9-5 lead. With second row Maurice Latrille playing as an 'auxiliary wing' after refusing to go off in spite of a broken collar bone, Toulouse were effectively down to 14 men. Yet they fought back. Bordes, who had played brilliantly in defence, crossed after a threequarter movement to make it 9-8, then scrum-half Bernard Berges kicked on from a scrum near the line and beat the cover to touch down. Toulouse continued to attack. 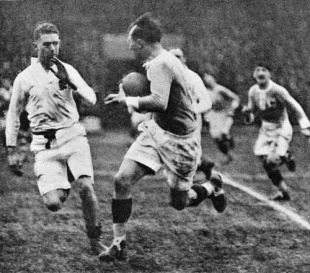 Bordes missed narrowly with a drop-goal and Alex Bioussa, a flanker so in tune with his times that he was to be dropped by France for his actions in a notoriously vicious match against Wales in 1930, knocked on close to the line before Dulaurens went over for his second try, taking the score to 14-9. Toulouse's pack had dominated in spite of losing Latrille and they were now further depleted with prop Gabriel Grioterray sent off for punching. Yet their ascendancy was scarcely affected. Far from having to desperately defend their lead, they further extended it as a dribbling rush was rounded off by Andre Camel - brother of No.8 Marcel - a 22 year old lock destined to win 16 French caps and retain his interest in rugby to the very last moments of his life, dying in front of his television as he watched France play Ireland in 1980. It was a match that left Voivenel with vivid memories of 'the incessant breaks of Berges, the authority with which Jaureguy was contained and most of all the perfection of the championship machine that was Stade Toulousain'. It was, as he wrote in 1941, the end of an era: "For whatever reason the two great protagonists of this apotheosis of rugby both stopped winning honours." Toulouse, winners of five titles in six years, were not to win another championship until 1947, then had a still longer wait for another, in 1985. Stade dropped out of the France's then highly inclusive First Division in 1949 and were not seen again at top level until Max Guazzini funded their rise under the new professional dispensation in the mid 1990s. Completing the set were seven-time winners Stade Bordelais. Eliminated 34-6 by Toulouse in the semi-final, France's first great provincial club, who won all their titles between 1899 and 1911, haven't been close since.